America’s multi-state super-lottery, MegaMillions, has given us some of the world's biggest ever jackpots. Its $1.6 million jackpot broke all records in 2018. 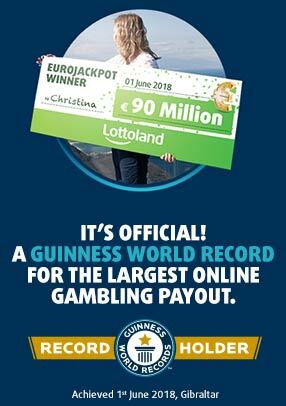 It's now the second biggest jackpot of all time and remains the first ever jackpot to exceed half a billion dollars. Draws take place every Wednesday and Saturday morning at approximately 4am Irish time and now you, too, can play for some of the biggest jackpots in the world with Lottoland. The official MegaMillions lottery is available to US residents only. So, with Lottoland, instead of entering the draw, you place a bet on the outcome. Pick your numbers as normal for a chance to win the same main game prizes, including the jackpot, as you could had you entered the official draw. The only difference is that you get paid faster, as we pay you your winnings directly. Choose 5 numbers from the main pool of 1-70 and 1 further number, known as the Megaball, from a pool of 1–25. You can also select the QuickPick option (Quick+1) and this will choose a line for you. Once you have chosen your numbers, select which draw you want to bet on, either Wednesday or Saturday, and press Submit. This will take you through to a checkout – at this stage just click Confirm and proceed to place your bet. You will win our jackpot if your 5 main numbers and 1 MegaBall is the same as those of the official MegaMillions draw. Yes, you can win all the exact same main prize values betting on the draw with us as those available in the official draw, including the jackpot. The DoubleJackpot feature allows you to go for twice the official lottery jackpot. So, for instance, if the official MegaMillions draw is €100m and you bet on the outcome with us and activate the feature, you will be eligible to win a jackpot of €200m. The prizes for all other tiers will remain the same. It costs double the price of your normal line to activate DoubleJackpot. So, if you wish to bet on MegaMillions with the DoubleJackpot feature the price is €7, instead of €3.5. The MegaMillions draw takes place every Tuesday and Friday night in Atlanta, Georgia USA at approximately 11pm local time, or around 4am on Wednesday and Saturday Irish time. The odds of winning the jackpot are 1 in 302,575,350. A breakdown of all the odds for each prize tier, together with estimated returns is included below the prize tiers question. The MegaPlier feature allows you to multiply the potential winnings on all non-jackpot prizes by either x2, x3, x4 or x5. The MegaPlier number is drawn by a random number generator. So, for example, matching all five regular numbers will secure you second prize, worth $1 million USD, or approximately €882,994. Adding the MegaPlier feature, for just €1 extra, could net you anything from double to up to fives times that amount. The table below explains the different prize tiers with the odds of winning each prize tier and the estimated individual returns for each prize tier. The information below is provided as a guide only. All prizes at Lottoland.ie are paid out in euros so the values below are also shown in euros. Please bear in mind, however, that the values shown are dependent on the dollar to euro exchange rate. Subscriptions remove the hassle of buying repeat lines and the fear of missing out on that big jackpot win. Our Subscription feature allows you to set up a running bet, or bets, on a given lottery draw. The subscription is open ended and will run for as long as you want it too. You can opt out at any time. Our JackpotHunt feature allows you to decide how big a jackpot you want to go for. So, for instance, if you only want to go for a jackpot when it is over €50 million simply set your participation level to €50 million and when the jackpot reaches that figure you will start betting. You will continue to participate until the jackpot drops below that figure. The JackpotHunt feature is open ended and will run for as long as you want it too. You can opt out at any time. At Lottoland we offer you the opportunity to go for the biggest jackpots the world has to offer and MegaMillions is the grandaddy of them all. This American legend costs only €3.5, grows without any limit and has created several of the biggest jackpots in history. You can also multiply your potential winnings by up to 5x with the MegaPlier option.